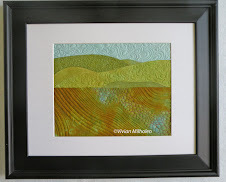 While landscape #1 is brewing on the design wall after being quilted, I am starting to think how I want to quilt landscape #2. 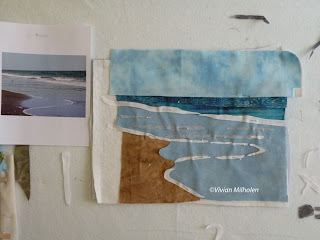 At this point, I think I will quilt all three first and then add the shading by painting or extra applique. These three maintain the same value in color so I think it will be easier that way. My creative muse is reeling in my brain with new ideas but I must finish these before moving to the next quilt idea. I had a little setback in finishing these...sick family members consumed a lot of my time. But I'm so glad at least a couple of them are feeling better. I think the nurturing part of me takes over when someone is sick and my creative muse keeps peaking out to see if she can come out, yet. I keep pushing her back and saying, "not yet". I'm also behind in updating my SAQA Visioning project, so I will also try to work on that update today. I am keeping up with my Artbizcoach.com class with Alyson Stanfield. It is a fantastic class called "Blastoff". 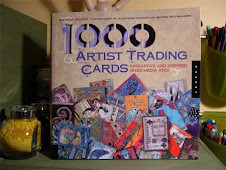 It gives you the necessary kick to get your art business off to a good start. Thanks for reading! Thank you for the comments! Vivian: Glad you're able to keep up with the class. And glad you're a part of it. I'm planning on working on some new affirmation cards tonight. I hope my creative muse pays a visit.